Treviso remained on course to represent Italy in next season's newly-formed European Rugby Cup with a bonus-point Pro12 win over Newport Gwent Dragons. If they finish above Zebre, Treviso will automatically be among Europe's 20-team elite next season even though they lie second from bottom. Ludovico Nitoglia, Luke McLean, Manoa Vosawai and Matteo Muccignat went over for home tries. 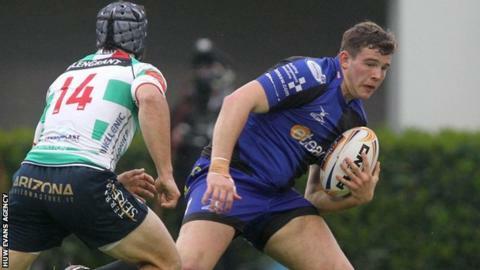 Matthew Screech, Ross Wardle and Cory Hill scored Dragons tries. The Pro12's entries to Europe's new top tier tournament has been cut from 10 spots to seven. One guaranteed representative from will come from Ireland, Italy, Scotland and Wales and the other three places being decided on league position. Treviso lie one place above bottom club Zebre in the table with eight points separating the Italian rivals as their remaining three games apiece loom. Barring a major slump, Treviso will be confident of holding on to their European status, particularly after this comfortable win over Lyn Jones' Dragons. The Welsh club at one stage had hopes of making their own challenge to be in Europe's top flight next season. But their recent form has seen them drop to third from bottom - one below Cardiff Blues - and in danger of being overtaken by Treviso. The hosts were 19-6 ahead at the break thanks to wing Nitoglia's try and fly-half Berquist's boot. Full-back McLean and centre Campagnaro went over in quick succession after the break. Screech and Wardle helped the Dragons stage a mini revival. But it was left to lock Hill to complete the visitors efforts after Vosawai and Muccignat had underlined the home side's superiority. Defeat left the Dragons without a Pro12 win since their 24-23 win over Glasgow Warriors in February. Treviso: McLean; Nitoglia, Campagnaro, Loamanu, Esposito; Berquist, Botes; De Marchi, Ghiraldini, Cittadini, Pavanello, van Zyl, Filippucci, Derbyshire, Barbieri. Replacements: Maistri, Muccignat, Fernandez-Rouyet, Bernabo, Vosawai, Sgarbi, Semenzato, Ambrosini. NG Dragons: Dan Evans; Tom Prydie, Pat Leach, Jack Dixon, Hallam Amos; Jason Tovey, Wayne Evans; Phil Price, Elliot Dee, Duncan Bell, Cory Hill, Matthew Screech, Lewis Evans (capt), Nic Cudd, Taulupe Faletau. Replacements: Sam Parry, Owen Evans, Bruce Douglas, Rob Sidoli, Jevon Groves, Richie Rees, Kris Burton, Ross Wardle.